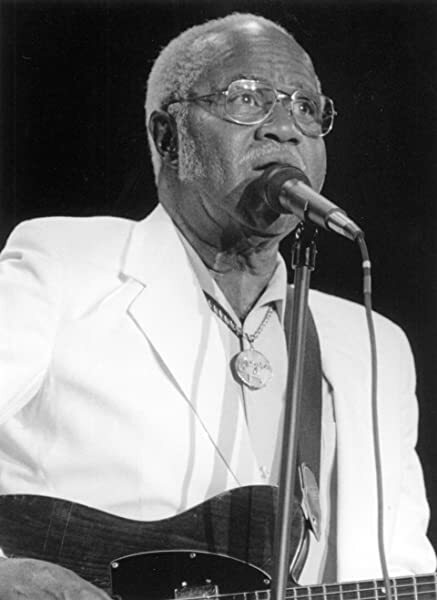 Here is Pops Staples (as in The Staples Singers & Mavis’ dad) doing an old blues tune called “Nobody’s Fault But Mine” on the Bobby Jones Gospel Hour. Everybody knows that Pops is a mean soul singer but he is one hell of a guitarist too. It’s really cool to see him digging into this solo gospel version of the Blind Willie Johnson classic. I love to hear him all by himself with just a Telecaster guitar and that soulful voice. You know what they say, you can take the boy out of Mississippi but you can’t take Mississippi out of the boy. Pops truly is a delta legend and one that I have a real soft spot for. Although, the Staple Singers haven’t gotten much love here on The GG, they are a certainly favorite of mine. With that said, you can expect a few pieces featuring Mavis and the family in the near future. Now check out the video below to see what old Roebuck ‘Pops’ Staples was getting into during the latter part of his career. It’s pretty awesome. There is an additional interview on the end of this video. It’s not really that interesting but if you’re into vintage politics alongside your vintage music, you may dig it. I’m also a big fan of Neil Young’s “Helpless”. Neil is fantastic, as crazy as ever. One of the coolest parts is that Joni Mitchell is lying in the shadows off stage singing backup. I always thought that was so weird but, I later read they wanted her eventual appearance to have more impact so they asked her to lay back early in the set. This song is so great, but accompanied by this band it’s larger than life. This is the Rick Danko sung beauty “Stagefright”. I love this tune and Danko, the bass player, is fantastic on all accounts. One of the things I love most about this band is that everybody sings and they all have very distinct voices that alone sound great but in concert with each other become something much greater than the sum of it’s parts. Of course the classics are always enjoyable. This version of “The Night They Drove Old Dixie Down” is accompanied by a huge horn section arranged by none-other-than Allen Toussaint. Drummer, Levon Helm, sings with every once of breath the man has in him. As usual, he’s superb. There is another “classic” that was shot on an MGM soundstage after the event. Scorsese decided to include this version instead of the live one from that night. I see why. It’s an amazing performance. The Staple Singers are great but more remarkable is the production. The sound quality and the video are noticeably better than the rest of the film’s footage. In the beginning of this clip, keyboardist/multi-instrumentalist Richard Manuel just finishes telling the story of how The Band got it’s name. If you’ve never heard the story, you got to check it out. It’s simple but Manuel tells it so well. As I said before, this was a long evening presented in multiple parts. On of which was focused on the blues. I felt I had to include this footage of Eric Clapton guesting on “Further On Up The Road”. The song is nothing too spectacular but there is this moment that I love. At about 30 seconds, Clapton takes the solo but about half a chorus in his guitar strap comes off and he yells “hold on”. Like true professionals, Robbie Robertson jumps right in and picks up where Eric left off. Robbie even tries to mimic Clapton’s style a bit. It’s pretty cool and I, frankly, I would regret not mentioning it. I could go on and on about this memorable night, but I need to end somewhere. I figure this is a fitting end as it kind of sums up what The Band was retreating with their transition from live act to becoming simply a “studio band”. This is Dylan’s performance of “Baby Let Me Follow You Down”. For those that don’t know, The Band used to be Dylan’s backing band (a great one at that). Given the significance of the evening and their relationship, they invited him to do a 4 song reunion set. But, this is where it gets interesting. Bob was reluctant to participate because he had his own film coming out and didn’t want to detract from that release. He agreed nevertheless but negotiations took place all the way up to his appearance on stage… obviously a very sensitive topic of for old Bobby boy. 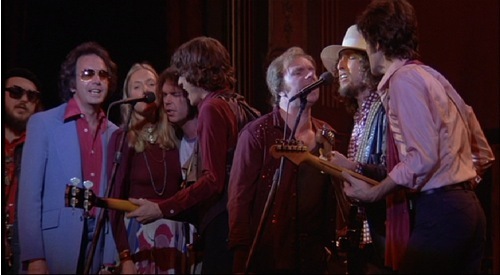 Reportedly, Robertson assured Dylan that the concert film’s release would be delayed until after his film, and with that Dylan relented and agreed to be filmed. As the promoter, Bill Graham was also involved in the talks. As the story goes, “Somebody working with Bob said ‘We’re not filming this.’ And Bill just said, ‘Get out of here, or I’ll kill you’,” Robertson is quoted in the liner notes of the 2002 album re-issue as saying, “It all worked out.” According to Scorsese, Dylan made the stipulation that only two of his songs could be filmed: “Baby Let Me Follow You Down” and “Forever Young”. He added, “When Dylan got on stage, the sound was so loud, I didn’t know what to shoot,” Scorsese later recalled. “Bill Graham was next to me shouting, ‘Shoot him! Shoot him! He comes from the same streets as you. Don’t let him push you around.’ Fortunately, we got our cues right and we shot the two songs that were used in the film.” …and yet it all seems so friendly and simple when you watch the movie.